A new report from the Center for American Progress and Women’s Voices, Women Vote, “The Other Half: Unmarried Women, Economic Well-Being, and the Great Recession” makes it clear that unmarried women make vital contributions to our economy and our communities. But these women face a myriad of challenges, and these are exacerbated if they are women of color. Unmarried women—women who have never married or are widowed, divorced, or separated—are now nearly half (47 percent) of women over age 18. They make up nearly a quarter (24 percent) of our total adult population, head 3 in 10 households, and are raising one-quarter (25 percent) of all American children under 18 years old. Unmarried women are consumers, homeowners, and workers, and they make vital contributions to the national economy. Together, households headed by unmarried men and women account for more than a third (35 percent) of national consumption. Unmarried women own nearly a quarter (23 percent) of the nation’s owner-occupied homes, and they are a fifth (22 percent) of the nation’s workers over age 18. Single women also contribute to their families and households: More than 6 in 10 (62 percent) in their prime earning years (ages 30 to 59) make at least half of their household’s earnings from work. But these women are much less economically secure than single men and married couples. Indeed, single women lag behind men and couples in earnings from work, household income, and wealth, and they are more likely to face poverty. And while unmarried women’s economic circumstances are generally precarious, the situation is worse for women of color. Unmarried women earn less on average than men or married women, so they possess fewer financial resources and are thus unable to reach their potential as a group in terms of their total share of national spending and homeownership. For instance, while unmarried men and women account for 35 percent of consumption, they represent about half of households. And just 3 in 10 unmarried women are homeowners (31 percent), compared with 80 percent of married couples. Further, low earnings and the lack of a partner put many unmarried women in a shaky financial position during downturns like the recent Great Recession. Single women have fewer savings to fall back on if they become unemployed or have their earnings cut. And if they also lack a secondary income source in the form of a partner or family member they may lose their home or experience increased food insecurity. Unmarried women of color have even less economic security than their white counterparts. This is a particular concern because women of color are more likely to be unmarried and facing the economic insecurity associated with their marital status. For instance, 68 percent of adult black women are unmarried, as are 47 percent of Hispanic women, compared with 43 percent of white women. “The Other Half” cites recent research by the Insight Center for Community Economic Development and notes that single women of any background have much lower wealth than couples or men of the same background. But single women of color have even less wealth than white single women. The Insight Center report shows that black and Hispanic single women have a median net wealth (the difference between assets and liabilities) of $100 and $120, respectively, excluding vehicles. That’s less than 1 percent of the median net wealth of couples, and just more than 1 percent of that of single men of the same background. By comparison, the median net wealth of white single women, at $41,500, is just 25 percent of white couples but 95 percent of white, single men. And nearly half of black and Hispanic single women (46 and 45 percent, respectively) have zero or negative net wealth—that is, their debts equal or exceed their assets—compared with a quarter (23 percent) of white single women. Single mothers of color have it even worse: The median net wealth of black or Hispanic single mothers is between zero and $120—even those whose children are grown. Unmarried workers’ unemployment rate is also about twice that of married workers. But among unmarried women or men, people of color have higher unemployment rates than whites, as Figure 1 shows. What’s more, women who maintain families—the vast majority of whom are single mothers—have the highest unemployment rate of all women. 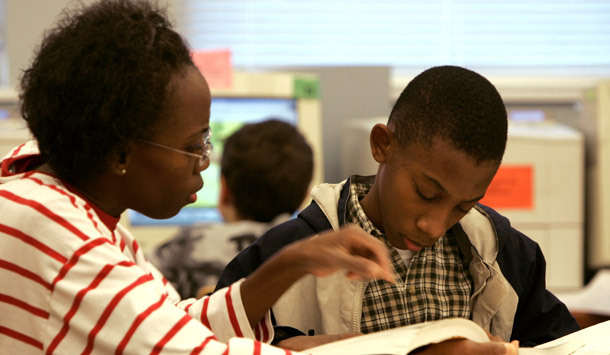 Fifteen percent of black single mothers were unemployed in 2009, as were 11.6 percent of Hispanic single mothers, compared with 6.6 percent of black and 9.7 percent of Hispanic married women, the ethnic group with the highest unemployment rate for married women. 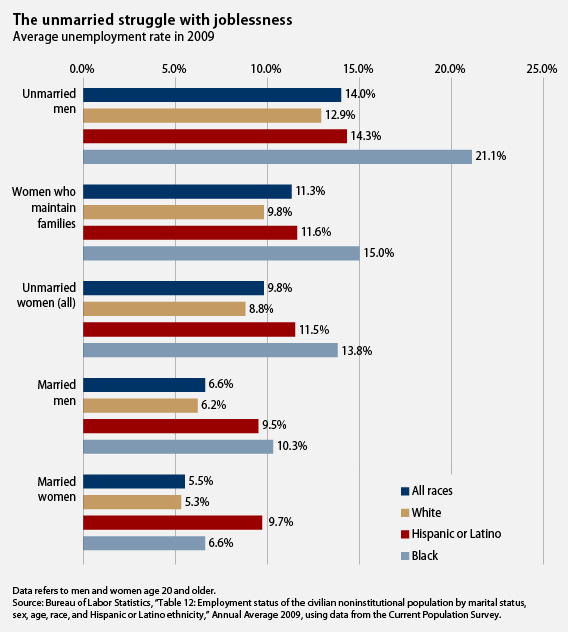 This high unemployment rate for married Hispanic married women results in a smaller gap between the unemployment rates of Hispanic married and unmarried women than for blacks and whites. Additional data indicates the income disparities people of color face. Figure 2 shows that single women—including single mothers—have about half the household income of couples. But blacks or Hispanics’ household income—both couples and singles—is less than that of their white counterparts. 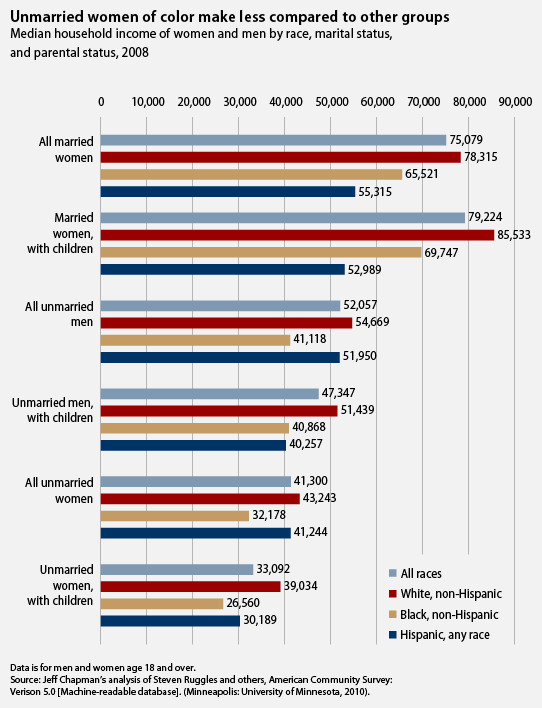 The income gap between single and married Hispanic women is much smaller than that of blacks and whites. The smaller income gap is in part a reflection of the lower household incomes of married Hispanic women than their black or white counterparts. It may also be in part because Hispanic unmarried women are more likely to live with other adults in the household: Three-quarters (74 percent) of Hispanic single women live with other adults compared with 58 percent of blacks and 55 percent of whites (data not shown in Figure). For these women, living with other adults likely adds some measure of economic security. “The Other Half” underscores the crucial role public policy can and must play to ensure that all people and families have a strong safety net, including extended unemployment insurance for the long-term jobless as well as policies that will increase long-term economic security. The report stresses job creation and job training, pay equity between men and women, and the need to address work-family conflict. Unmarried women’s economic potential is not yet realized. But by boosting this group’s economic strength we can tap into this potential, and everyone will benefit. Liz Weiss is a Policy Analyst with the economic policy team at the Center for American Progress.
. Unless otherwise noted, all data in this column is from Liz Weiss and Page Garder, “The Other Half: Unmarried Women, Economic Well-being and the Great Recession” (Washington: Center for American Progress, July 2010).
. Jeff Chapman’s analysis of Steven Ruggles and others, "American Community Survey: Version 5.0 [Machine-readable database]" (Minneapolis: University of Minnesota, 2010).